In most American cities, the thought of banning cars is as ridiculous as banning cell phones, or dogs, or pants. Even in a city like New York, in which owning your own car is impractical, the streets are still choked with taxis, Ubers and delivery trucks. The city would totally shut down without them. Such a ban has happened, though, and in the most car-crazy state of all: Michigan. 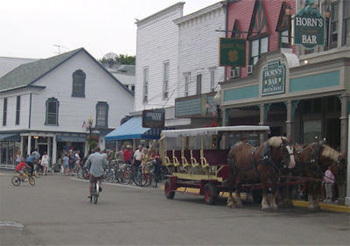 We talked with Chris, who lived and worked in Mackinac, where horses and bicycles are kings and cars are unwelcome beasts. In the 1890s, residents of Mackinac Island discovered that these newly invented "cars" scared their animals and were generally disturbingly loud. So they rejected gimmicky horseless carriages and held on to their own slow pace of life. They instituted an auto ban that still stands today. There are a few exceptions -- emergency vehicles, and stuff brought in for the occasional film shoot -- but you can't have any cars for personal use. Break that rule, and prepare to feel the wrath of the island. In the past, residents who smuggled cars to use as school buses for kids in the winter had to work in secret, like something out of a dystopian Fast & Furious reboot. More famously, one guy ferried his car in and drove it openly, certain the rules weren't for real. The automobile was impounded, the whole thing went to court, and the car wound up parked in a barn until such time as the island lifted the ban. The guy died 50 years later. The ban has since outlived him by 30 years and counting. The island does have a few golf courses with their own electric carts. But if some golfer is too tired to walk home and tries riding their cart into town, that breaks the law and is the biggest emergency the town will see all year. Chris saw this happen -- police chased the golfers in their own vehicle, an SUV that only appears when someone's grievously injured, or worse, is riding a golf cart through town. The golfers were fined and were outcasts for the rest of their time on Mackinac, and that was for driving through town for only 30 seconds. "If they had stopped and got ice cream," says Chris, "there would have been a mob." It's taken so seriously that mysterious unclaimed golf carts spark police investigations, and the city council puts out entire committees on golf cart use. The only reason you didn't see this already as a storyline on Parks And Rec is that the people of Pawnee were considered too modern and reasonable for that sort of thing. 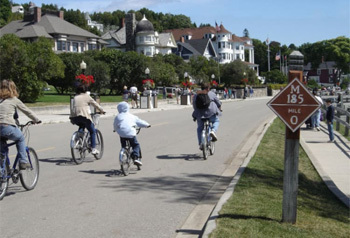 Getting around through Mackinac solely on foot isn't impossible. It's not a large town. At four square miles, it's around a tenth the size of Miami or San Francisco, or about three times the size of Central Park. But even Central Park has some roads and cars (and we're pretty sure San Francisco and Miami do, too). There's some stuff you simply can't do on foot. Like, say, transporting lots of heavy objects. Mackinac's an island, so supplies have to be hauled in by ferry. With no trucks or cars, it's up to horses and carts to make sure no one starves. "Freight unloading can be a nightmare," says Chris, especially when passengers are in the mix. Chris worked at a hotel, and the horse-and-buggy ride there would take so long that in the summer, food would start to spoil. That's not a problem we thought we'd have to deal with this century. So summer brings problems. Winter is worse. "This is dead-of-winter, winds-coming-off-Lake-Michigan cold," says Chris. "The wind chill goes deep into the negatives. And every mode of transportation there is not heated, covered, or anything ... You can dress thickly, but if you need to go to the store, bikes aren't working and horses aren't around, so you're walking, or if you're lucky, you have a snowmobile." Yes, the town does allow snowmobiles, though they've had major fights over the issue. A snowmobile can zoom you from place to place, and it can even get you to the mainland over the ice bridge that forms in the winter. Then again, people have also died trying that stunt. Others have died when their snowmobile acted up and sent them off a cliff, and every death's a big deal in a town whose population lies in the low hundreds. It's almost enough to make us wish for some hypothetical system wherein fast vehicles are confined to specific paths. Because they use wheels. They could be driven by motors of some kind. 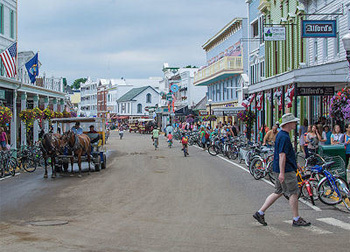 You might assume Mackinac is famous as the car-free island, and that everyone who visits comes for the novelty. But Chris estimates that a fifth of people who come have no clue about the rule. They head over to see the state park, or the Revolutionary-era fort, or for the golf, with no idea beforehand that cars are verboten. For some, it's a pleasant surprise. For others, it's like ordering at a restaurant and then finding out they're not allowed to use their hands to eat. Chris's job one summer was helping people off the ferry, and he says that every so often, tourists would clamber off the boat with five suitcases and then have no idea what to do. Many are from Detroit, and when you're from the Motor City, life without cars is madness. Some experience actual panic attacks. "I know it sounds like something that shouldn't happen," says Chris, "but it does." One couple angrily asked him where the car rental office was, and when he told them the town had no cars of any kind, they didn't believe him until a bunch of other people backed him up. They then asked him where to catch the bus, and Chris had to say there was no bus either. "I can call you a taxi, sir," he offered. "Fine!" said the husband. But then he learned the taxis are horse-drawn carriages. "No, we won't do horses," he said. "Can the ambulance take us there?" It couldn't, and there was no more Chris could do for them. In the end, that couple lingered for four hours at the dock before finally relenting and leaving in a horse cab. Others like them offered Chris bribes in exchange for one of the "hidden cars you only get by asking" (no such cars exist). "A few even say they wouldn't be caught dead in a horse carriage," according to Chris. It turns out rich people don't always like horse-drawn carriages. So that's one more thing Disney lied to us about. A ban on vehicles is based on more than keeping the streets clear. It's about preserving an old way of life, which means banning a bunch of non-car stuff as well. When a business wanted to get some landscaping done on a lot that hadn't been touched in 30 years, they needed a vehicle permit for a stationary wood chipper, even though we weren't totally aware that those wood chippers count as vehicles. Another time, Chris made the mistake of attending a city council meeting, where he got to witness an angry debate over whether to let a concrete mixer come to Mackinac temporarily, with talk of whether or not it would ruin the island. "Our job is not to make it easier for them," said a council member at yet another meeting over the deeply controversial issue of construction permits. A hotel ordered an excavator for a project connecting two buildings, and when the council pulled the permit, the contractor had to get down and dig up the ground by hand. So more vehicles could improve safety, move goods faster, not freeze you in the winter, and generally catch everyone up to the modern world. But Mackinac's not letting any in. And the reasoning for that really boils down to: We like it this way and it's unique, so why change? "I worked there for years," says Chris, "and I still struggle to comprehend that mindset." He clearly is approaching it from an outsider's point of view. When he first came to the island, he'd recently read the short story "The Lottery." Even if you haven't read it yourself (it's online, 3,000 words), you've definitely seen it parodied or copied in various stories about small towns with sinister secrets. The residents of Mackinac sounded eerily to Chris like the townsfolk from that tale. "It's how we like things here," one mother might recite as a mantra as she pays $100 for a family carriage tour. "It's our way of life," some smiling man would say, pulling his foot from one pile of horse poop and landing in another. Chris isn't saying people there are stoned to death or anything. But now that we think about it, when was the last time anyone checked in on golf cart guy? Because the dark spirit Mackinac abhors motor vehicles. And Mackinac must be appeased. Or maybe we're the weird ones for being unable to imagine the world any other way. 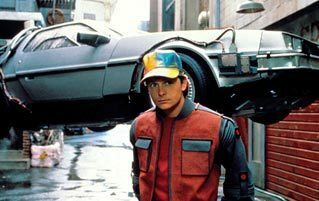 Maybe a generation from now, we'll have the one eccentric village that doesn't allow cybernetically engineered telekinesis. "But how can you be expected to shop if you can't float the items into your cart using the nanobots in your bloodstream? 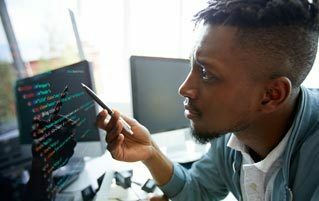 You know that the omniscient AI that rules the Earth has declared such behavior to be unacceptable." Maybe we always need a place like that, to remind us what things were once like, for better and worse. Evan V. Symon is a writer, interview finder, and journalist for the Personal Experiences section at Cracked. Have an awesome job/experience you'd like to see up here? Then hit us up in the forums. Be they Hot Wheels or LEGO, enjoy your cars while you can! For more, check out 5 Things That Were So Effective They Had To Be Banned and 6 Bizarre Reasons Famous Foods Were Banned.